Batgoat – I'm fairly sure no one is reading this. I'm fairly sure no one is reading this. I really wish I knew what was going on here. I’ll have to track down the issue number and give this story a read. 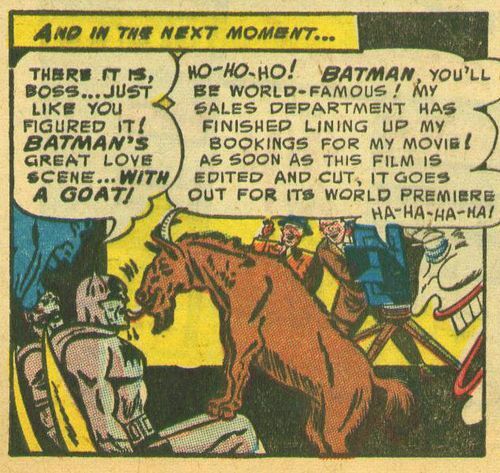 Really, there has to be more to The Joker’s plan than to embarrass Batman by showing the world a movie where he makes out with a goat. Why would you want to know the truth? I log this under the Ignorance is Bliss file. Sir, if there are only two things that are important to me in this world, they are Batman and Goats. In that order.